A hundred years ago the area of West Farleigh, off Charlton Lane was known as the Monkey’s Hole (or more likely Monkey’s ’ole!) It was then part of Hall Farm - the 'Hall' being Smiths Hall. 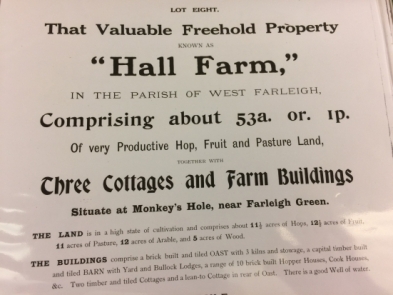 When Hall Farm was auctioned in 1911, it had 11.5 acres of hops, 12.5 acres of fruit, 11 acres of pasture, 12 acres of arable and 5 acres of wood. No space for football in those days. At Monkey’s Hole there were 2 timber and tiled cottages, a brick and tiled oast, with three kilns and stowage. 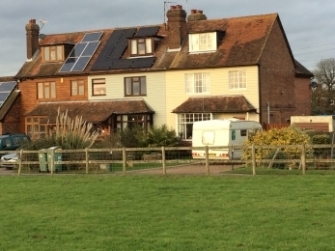 A timber tiled Barn with yard and bullock lodges, a range of 10 brick built hoppers huts with cookhouse etc. 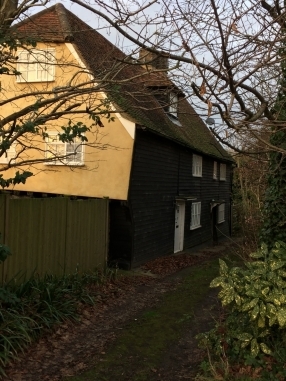 There was a leanto cottage at the rear of the oast. And a good well of water. The well is probably still there, however, hopefully covered over now. There is not a barn there any more, but the two timber cottages are still there as is the oast. However it would be difficult to recognise today as it has been turned into a terrace of three houses. The leanto cottage is long gone. Park Cottage, further down Charlton Lane, was the farm dairy and some older villagers can remember going round the back with their cans to collect the days milk for the family. 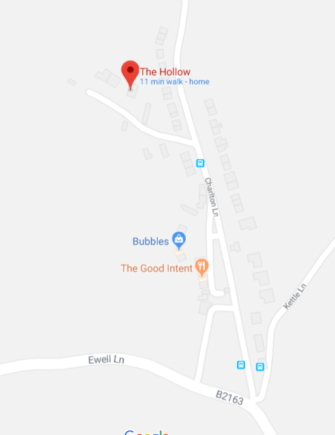 As the area is now posh, the name has been changed to The Hollow! From Monkey’s Hole to The Hollow!